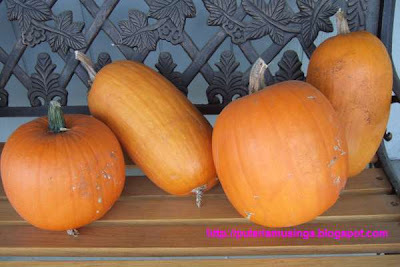 Sorry..don;t know how to eat pumpkins....the ones in Malaysia...are there as big as the ones u have? dunno lah, I see some big ones, but usually not that big. Pumpkin seeds? sure you know how to eat, right? manis ari labu menua kitai kah? Enda manis labu tu, nya lah betimbun dia. Aku mina ka makai ka manis. Pumpkin pies, Puteri? I personally don't like them but a lot of people do. But yeah the ones that you have are huge! Rita, making pumpkin filling for the pumpkin pie, too much work! I don't mind pumpkin pie, though.